Very early preservation days at Blunsdon, on what would later become the Swindon & Cricklade Railway. 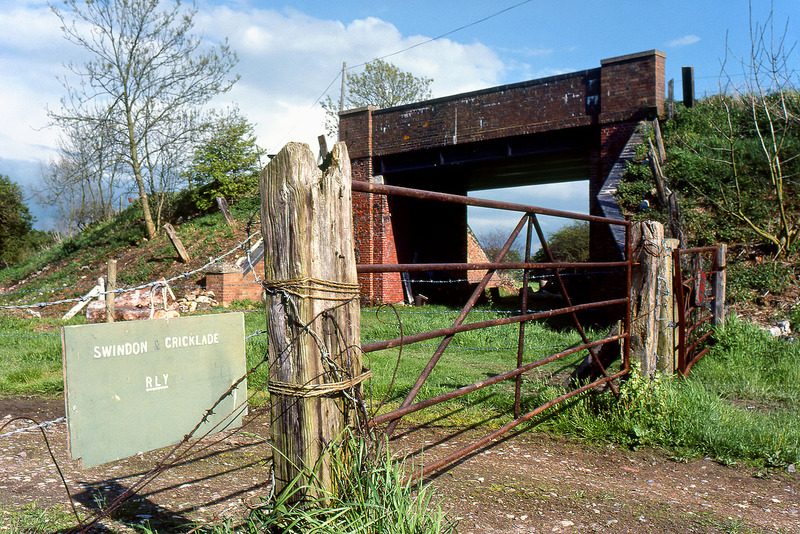 This picture, which was taken on 27 May 1979, shows the roadbridge at Tadpole Lane, Blunsdon, which was then in open country, rather than on the edge of Swindon's urban sprawl, as now. The only indication of the Swindon & Cricklade Railway Society's interest in the site, is the rather crude handmade notice hanging from the barbed wire. The original Blunsdon station opened in 1895, one of the last stations to be opened by the Midland & South Western Junction Railway. The GWR's ambivalence towards its former competitor is possibly why it closed to passengers in 1924, shortly after the grouping, although it remained open to goods traffic until 1937.